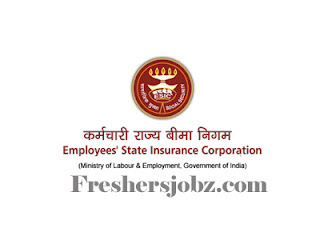 ESIC Notification 2018.Employees State Insurance Corporation ESIC has released a notification for the recruitment of Junior Resident, Tutor and Senior Resident vacancies.Check the eligiblity and notification prior to apply for the positions. 1. Mere submission of application does not confer any right to the candidate to be interviewed. 2. Application should be submitted in the prescribed format only. The applications found to be incomplete will be summarily rejected. 3. Wrong declarations/ submission of false information or any other action contrary to law shall lead to cancellation of the candidature at any stage. 4. Opportunity of interview given to candidates will be on provisional basis. The selection will be made on the basis of performance of the candidate in interview before the Selection Board. Result will be displayed on web-site: www.esic.nic.in. The candidate should check his/her eligibility against the advertised criteria for each post before applying. Only eligible candidate should appear for the walk in interview with the following documents on the stipulated date, time and venue mentioned. (vi) Pension Payment Order (PPO), in case of retired employees from Govt. organizations.